The Spherion TRI LED produces an effect that is similar to a modern Mirror Ball. It features five bright 3-Watt Tri-color LED sources that project sharp beams of light from 116 lenses that rotate and fill an entire room. The unit has a low 27W power draw, and includes rubber feet and a removable hanging bracket so the unit can be set on a floor or table or hung from the ceiling. It’s three DMX channels allow users to control rotation speed and direction, dimming, strobing and color changing. The Spherion TRI LED also features exciting sound active programs that can be accessed by just turning on the fixture. Considering purchasing the American DJ Spherion TRI LED? Have questions? Ask people who've recently bought one. Do you own the American DJ Spherion TRI LED? Why not write a review based on your experience with it. Bought these as couldn't wait for the new Starbursts to be in stock due to booking commitments. However not disappointed but suspect I will change at some stage due to the limited or non existent colour mixing ability of this product even when using full DMX control. Really well engineered piece of equipment. 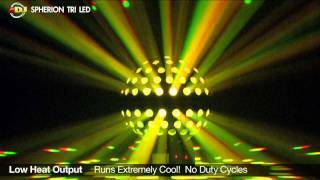 Seen a video for American DJ Spherion TRI LED online or have you own video? 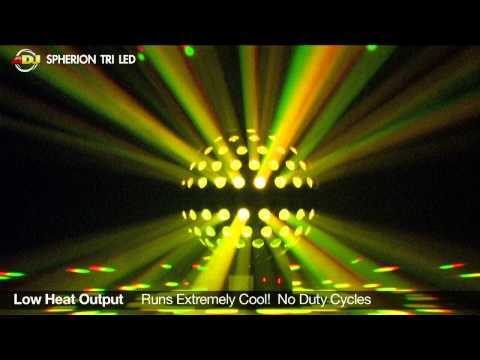 Check out American DJ Spherion TRI LED on DJkit.com!